This post, with a spotlight on PPC for B2B, is part of a series focusing on specific PPC strategies per industry. While the basic components of every PPC campaign are the same, no two are identical. Consult your industry’s guide for tailored tips! Without a doubt, paid traffic is one of the fastest ways to acquire new B2B leads. The problem is, there’s already so much noise on the SERPs. 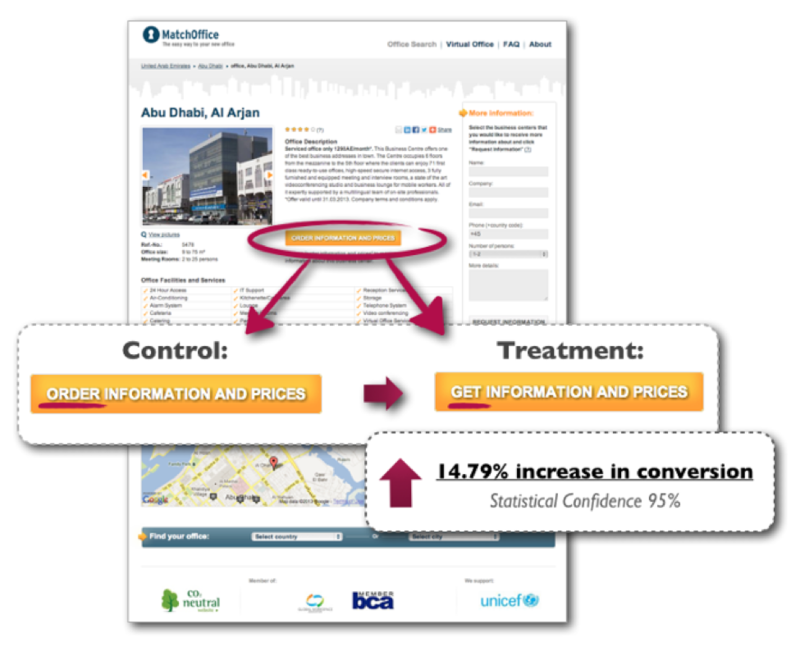 How do you cut through it to create profitable PPC B2B campaigns? The business-to-business landscape has a unique set of challenges compared to the business-to-consumer landscape and these carry into marketing and advertising strategy. Yet there is also a lot of overlap between B2B and B2C when it comes to executing campaigns. In this definitive guide, we’ll take all this into consideration and teach you exactly how to set up and optimize your B2B AdWords campaigns to boost your lead generation efforts. We’ll cover everything from selecting the right keywords to writing effective ad copy. Bid on the right keywords, and you’ll attract the right traffic with a high conversion rate. 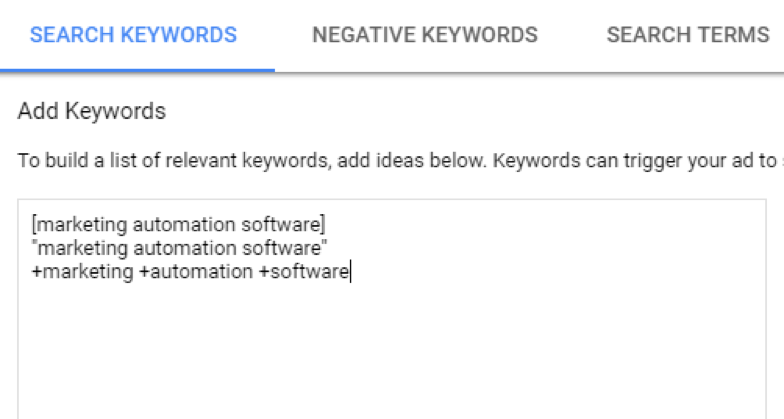 Choose irrelevant keywords, and you risk generating a negative ROI. When any business is selecting keywords for a PPC campaign, they must keep specificity in mind. Broad terms such as “marketing software” may generate lots of searches, but they may not be relevant to the searcher. However, a long-tail phrase like “landing page software” is more specific to the searcher’s needs. Businesses need to get into the minds of how other businesses would search for their products and service. Personally as a marketer who has searched for different martech tools, I try to make my search as specific as possible to avoid wasting my time sifting through irrelevant search results. Use broad terms as a starting point in your research, but make sure to then drill into more specific keywords. For example, from “marketing software” you can dig down into “marketing automation software,” “free marketing automation software,” etc. 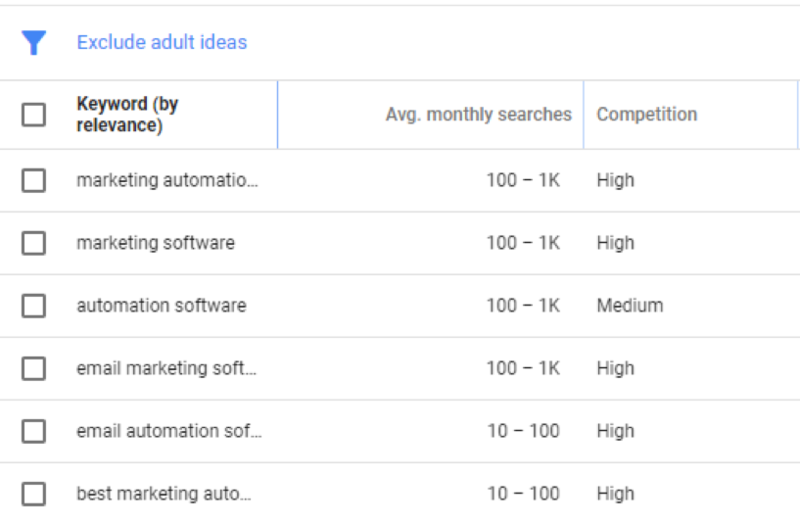 Once you’ve brainstormed some keyword ideas, it’s time to use keyword research tools to select the ones you’ll pursue. For this task, we’ll use Google’s Keyword Research Planner. Here, Google provides relevant keywords based on your “seed” keyword. When choosing which keywords to target, the number of monthly searches should be your leading metric. This is the number of people who are searching for this term each month, and therefore indicates demand. You’ll also see how competitive each term is, ranked by High, Medium or Low. Higher competition means more people competing for a keyword, and therefore a higher cost-per-click (CPC). Therefore, you want to find keywords with a high volume and low competition. These keywords are ideal for more profitable PPC campaigns. B2B marketers selling obscure products and services may unfortunately suffer from low volume keywords, but will also likely benefit from low competition. Competition is given a score from 0.0 to 1.0 – the higher the number, the more competition. It’s an alternative that gives you more granular insight on how much competition there is for a given keyword. Notice that in the Ubersuggest example above that the two highest volume keywords have the lowest competition? This is evidence of B2B marketers in this category wisely bidding on more specific keywords, rather than wasting money on clicks for marketing keywords that are too general. It’s good to get a snapshot of what your competition is currently doing. Uncover which keywords they’re targeting, and the ad copy they’re using to direct your overall PPC strategy. Auction Insights provide a snapshot of who else is bidding on your keywords, what share of impressions they’re getting and their average position. You can access Auction Insights directly from your Ad Groups. You should also put yourself in the shoes of your target audience. Search for your target keywords on Google and see what comes up. What ad copy is your competition using? How are the landing pages structured? 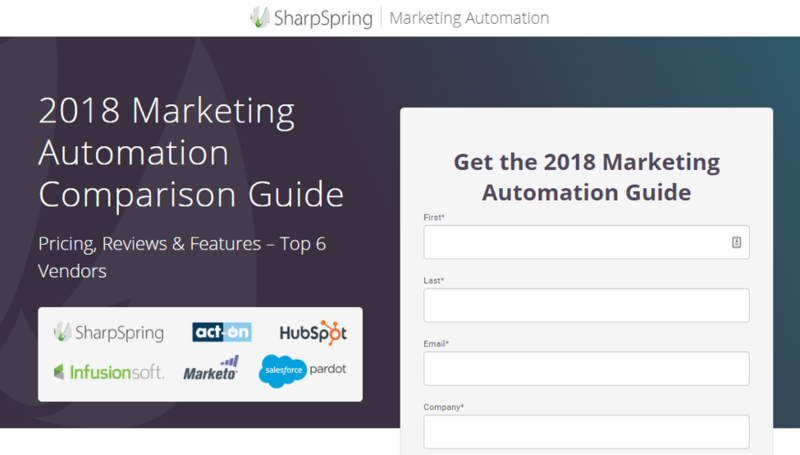 Their landing page includes the “marketing automation” keyword and logos of leading marketing automation platforms, which will help this B2B guide get downloads! Analyze every step of the journey. Look for ways you can write copy that stands out from your competitors. 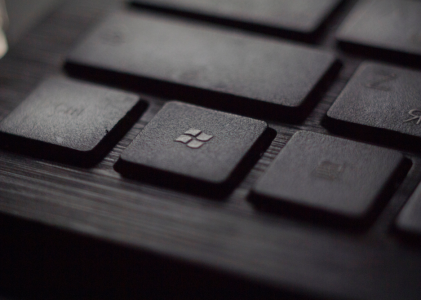 Identify areas of friction on their landing pages that you can alleviate on your own. Once you have your target keywords, it’s time to set up your campaigns. In this chapter, we’ll cover the proper way to set up effective B2B PPC campaigns that generate targeted traffic and leads. Proper PPC campaign organization is important, whether you’re a B2B or a B2C advertiser. By having the right account structure, not only will you be able to monitor and optimize over time, but also boost Quality Score (QS) and therefore conversions. “Call Only:” For generating phone calls. “Display Network:” Uses display ads across the Google ad network to increase brand awareness. “Remarketing:” Run these to engage with users who have already visited your website. All of these campaign types are potentially helpful for businesses but some will speak to certain businesses more than others. For example is you’re a business that doesn’t have a website, a call-only campaign may work well for you. Call only campaigns can be best for very complex B2B sales that require discussion as well. Note: this is the same button you’ll use to add new ad groups, extensions, etc. Go through the wizard and set your target location, language, and bidding strategy. Targeting is extremely important to not waste money. For local businesses that only service other regional businesses targeting by location will be extremely important to get PPC results. Finally, you’ll need to set budget. Your monthly budget is calculated by taking your daily budget and multiplying it by 30.4. Start with a monthly budget you’re comfortable with and adjust from there. This guide from Digital Monopoly provides more information on how to decide on an AdWords budget. The next “layer” below campaigns are Ad Groups. They provide a structure for your campaigns to organize your ads by theme and objective. This structure provides ultimate control over your keyword-to-ad match. There are two ways to structure your Ad Groups. The first is to take 5 to 10 relevant keywords and categorize them into one group. This way, you can create scalable campaigns quickly. The second method is to create a single keyword Ad Group (SKAG) for your most successful keywords. This approach leads to a higher QS and click-through-rate (CTR) while reducing your cost-per-click (CPC). Ad variations in ad sets can help a lot with keeping costs down. Instead of targeting one massive audience with one ad that may or may not be very good, break your audience down. Target different segments of your audience with different, more tailored ads. Broad match: Your ad will appear for searches related to and synonymous with your target keyword. For example, “marketing automation software” may also rank your ad for “email marketing software”. Phrase match: The ad will only appear for searches that include your target keyword in the order you’ve given. For example, “best marketing automation software” or “marketing automation software examples”. 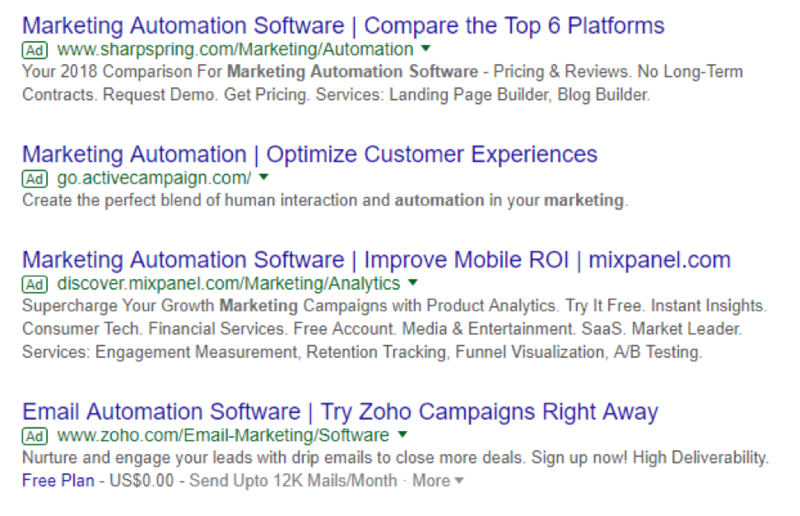 Exact match: Your ad will only appear for the exact keyword, i.e., “marketing automation software”. Setting a maximum CPC informs AdWords how much you’re willing to pay when a user clicks an ad within this Ad Group. You can reduce your CPC and pay less while appearing higher up in the SERPs by having a higher Quality Score. So, what exactly is Quality Score? According to Google’s definition, it’s “an estimate of the quality of your ads, keywords and landing pages. Higher quality ads can lead to lower prices and better ad positions.” You’re more likely to score a perfect ten if your target keyword, ad copy and landing page are all aligned. Remember how the keyword “marketing automation” was included in both the ad and the landing page in Chapter 1? That’s a good starting example. You’ll learn more about how to do this in upcoming chapters. You’ve created the perfect AdWords campaign structure, and loaded in your target keywords. Now it’s time to create compelling and persuasive copy that generates highly targeted traffic. The headline of your ad is the first thing that searchers are drawn to. Therefore, you need to write a headline that will stand out from the other businesses advertising on the SERPs. The first thing to consider when writing ad copy is user intent. Is the user searching for this keyword trying to find a solution, to buy a product or to learn more information? Understanding this intent will drive your copywriting efforts and the landing page you drive traffic to. Navigational: The user is searching for a specific product, website, or brand. Informational: The user is searching for the answer to a challenge or question. Transactional: The user is searching for a product and is ready to buy. If someone is searching for informational keywords, don’t send them to a product page. Instead, provide a whitepaper or eBook they can download in exchange for their details. This way, you can guide them through the buyer journey using back-end systems. While the example ad copy in the image above speaks more to a B2C marketers, human psychology will apply to B2B ads as well. Include the number of users you serve to boost social proof within your headline. Talk about the number of years you’ve been in business to show stability and credibility. Show how many hours or dollars are saved each month as a result of using your product. If you use numbers make sure it adds to the persuasion factor. What is the ultimate benefit that your customers get from using your product or service? Make this crystal clear in your headline. PPC ads provide limited space for copy – 30 characters in the headlines and 80 in the description, to be exact. Therefore, your ad description copy must get to the point quickly. Why swipe copy ideas from them? Because Google has ranked these results as “most relevant.” You can also use the top examples of what not to do. You’re also more likely to stand out from competing PPC ads, as nine times out of ten they’re taking ideas from each other. Finally, find ways to build a sense of urgency. In the consumer world, this is easily done by creating limited discounts and showing how much inventory is in stock. For us B2B marketers, we’ll need to get more creative. A marketing automation company could offer free service package upgrades for a limited time perhaps. B2B executives, especially marketers, are held accountable to set KPIs and metrics. 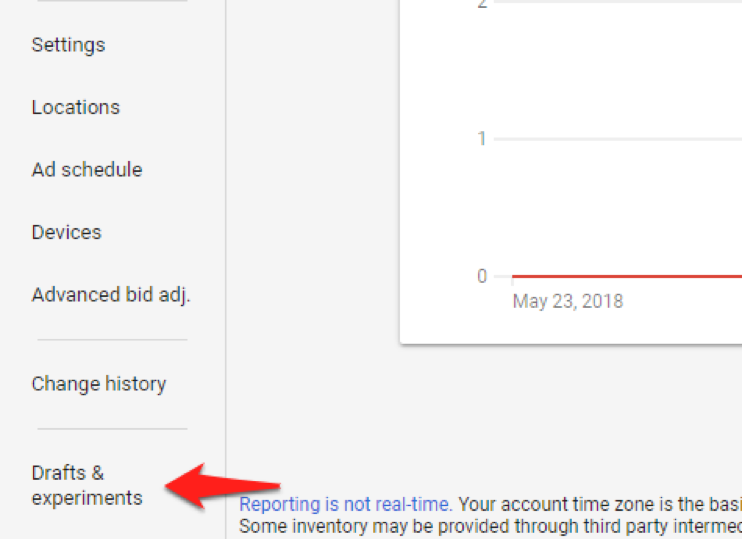 For our “marketing automation software” example, one way of creating urgency is to play upon these metrics, e.g., “reach your inbound lead goals before Q3”. You’ve got their attention. Now it’s time to drive them to the click. Your ad copy must include a call-to-action (CTA) stating exactly what you want searchers to do. For example, if your landing page offers a whitepaper, your CTA might be “Download your free guide.” Or, if you’re offering a demo of your service, it could be “Book your free demo today”. By now, you should have your AdWords campaigns set up. The question is, what happens once a searcher clicks? As we discussed before, after the click comes the landing page that should include your target keywords. Landing pages are the last step of the PPC journey. Each campaign must have a landing page tailored to what the searcher is looking for. Do this, and you’ll increase Quality Score and conversions. Let’s look at some grade-A landing page examples to dissect what makes them so successful, and how you can emulate what they do. Not to get too meta, but here, Instapage, a landing page creation platform, gets straight to the point. 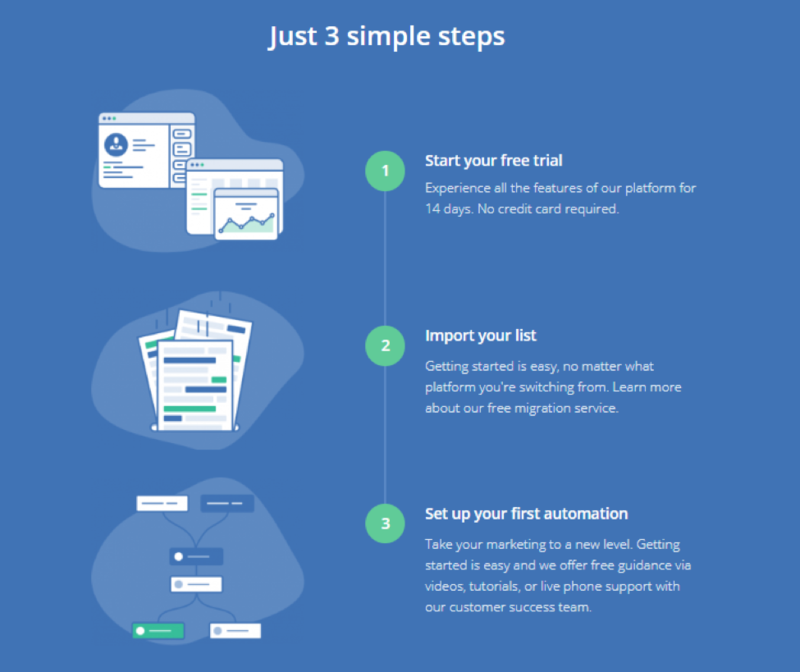 The primary action they want you to take is “start a free trial.” However, for those who aren’t convinced, there’s a secondary CTA to request a demo. They also completely remove navigation. In its place is the primary CTA. This is clever, as it captures users who usually head straight for the navigation bar to click around. Finally, they reinforce social proof above the fold by showcasing client logos. With heavyweights like eBay and Udacity on the roster, it’s hard not to see the credibility here. 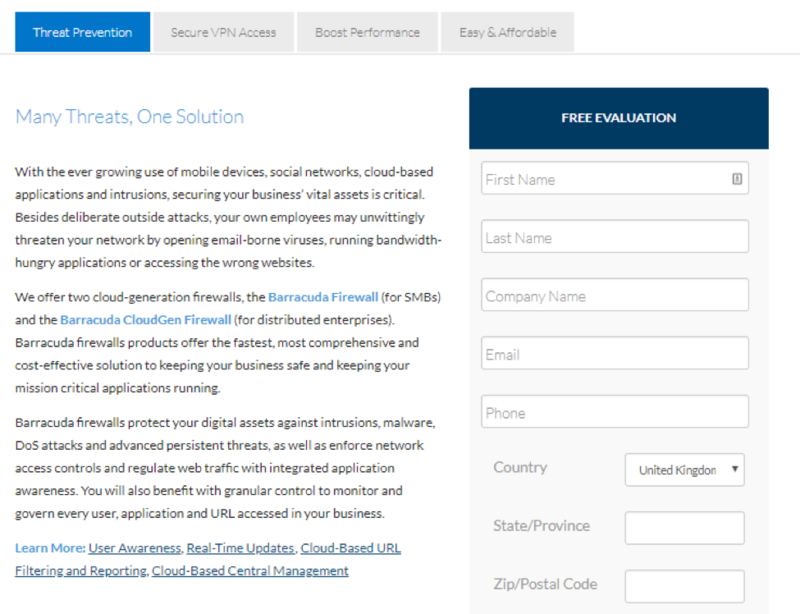 Cybersecurity platform Barracuda have a slightly more cluttered landing page, but for good reason in their unique B2B situation. Senior IT executives usually require more information before deciding to take the next step. Looking below the fold, they tidy things up by providing tabs that categorize certain types of information. Most importantly, the form is accessible at all times. This means users can take the next step without having to retrace their steps. When building your forms, consider using as few form fields as possible. 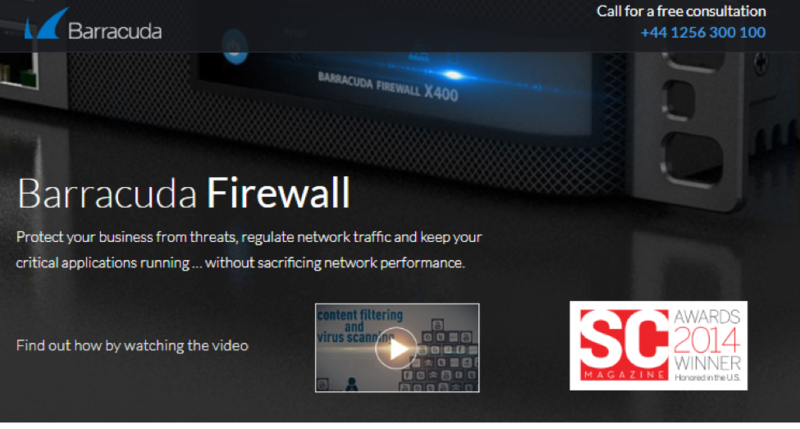 While Barracuda have used eight fields in their form, it’s likely you’ll see less form friction with fewer fields. Using the phone number entered for example, Barracuda could have eliminated the Country and Province fields as these would be revealed by the area code. The more fields there are, the more friction you’ll get, which leads to a reduced conversion rate. In this “marketing automation software” keyword to landing page example, ActiveCampaign is designed elegantly. The simple headline and sub-header reinforces the value proposition while boosting social proof with ratings from third-party platforms. Remove navigation to reduce “unsupervised browsing”. Add one (maximum two) call-to-action to get the user into your sales funnel. Add as much social proof as possible. Include ratings, company logos and testimonials. Reduce form friction by only asking for the most important information. 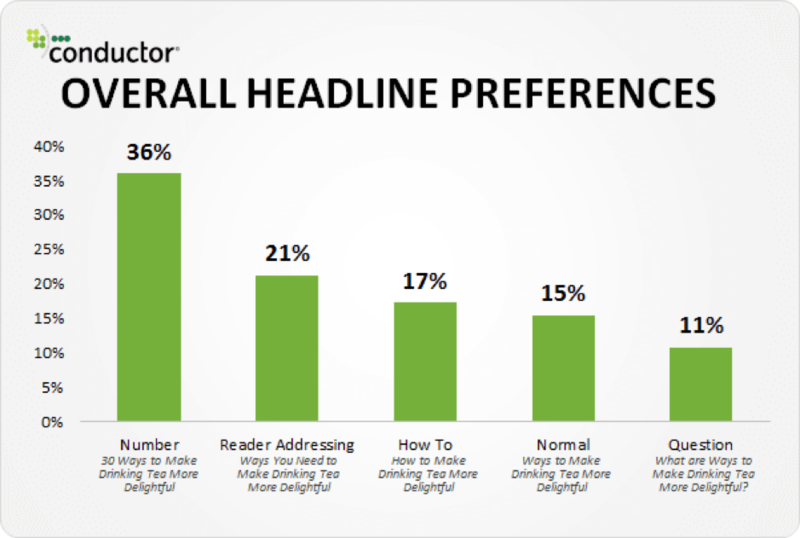 Ensure your headline and copy matches your PPC ad. Looking for an easy solution to landing page creation? 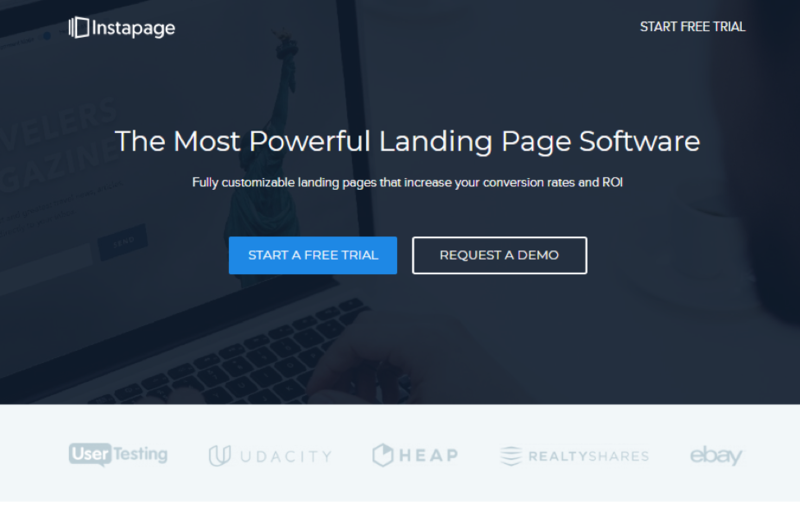 Our friends at Unbounce have a great drag-and-drop builder that lets you create beautiful landing pages quickly. 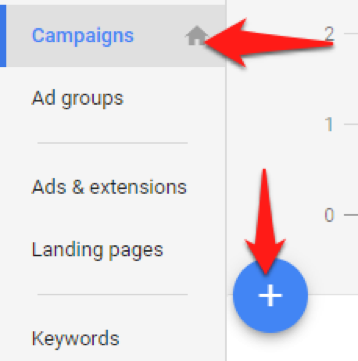 There you have it; you now have a complete AdWords campaign set up from start to finish with some helpful B2B insights. 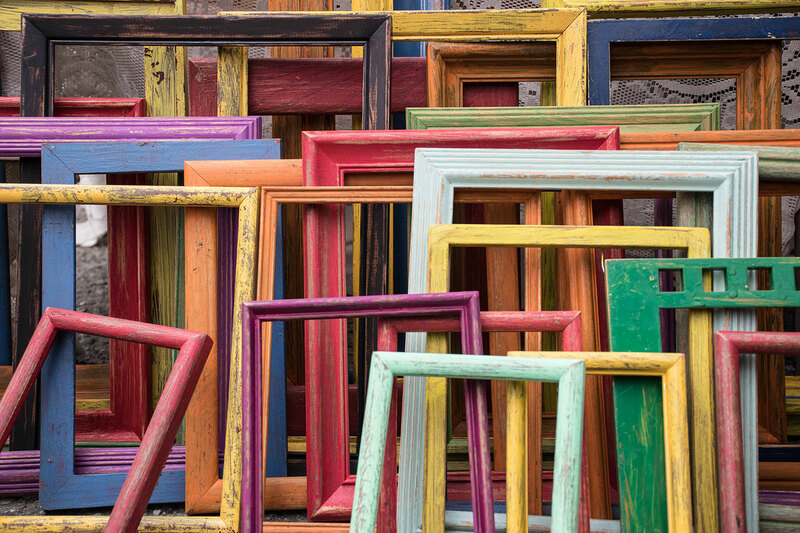 Over time, you’ll start seeing results and generating data, but what should you do with it? This is where constant optimization is important. To wrap-up this guide, let’s look at how to measure your AdWords efforts and optimize them for better results. 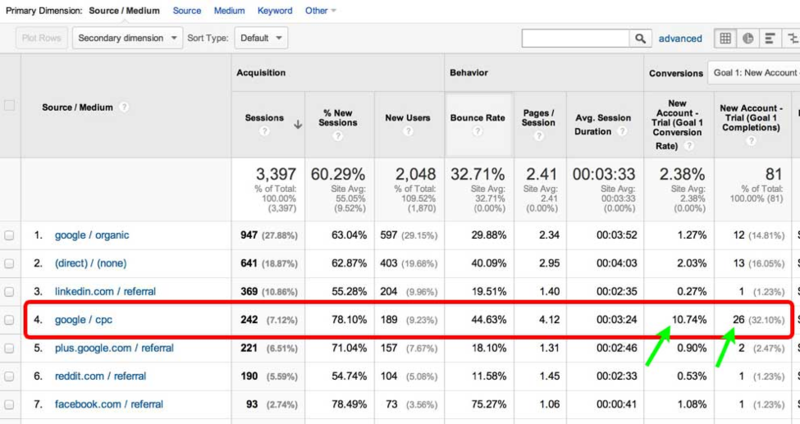 First, you need to get your AdWords data into Google Analytics. This way you can measure PPC performance alongside user behavior and conversion data. Make sure you have Goals and Events set up to measure conversion rates and PPC traffic behavior on your website. Here’s a great article on Search Engine Watch to help you get started. Before we talk optimization, it’s important you start this journey by creating new Ad Groups for specific keywords. You can do this once you’ve generated enough data to uncover your highest performing keywords. Refer to chapter two for more on this. Then, click the blue “plus” button and follow the wizard to create a new ad variation. I strongly recommend you test only one element at a time when running experiments. If you test a new headline and call-to-action and generate better results, you’ll never know exactly what did it. Start with the headline. Test new numbers, benefits, and ways of communicating credibility. Then move to your ad description and call-to-action. When you finish an experiment, roll out the winning ad variation and start over. Landing page optimization is just as important as your ad copy. These are the machines that generate conversions and leads for your sales funnel. Optimize your landing pages over time, and you have a chance of boosting your conversion rates. 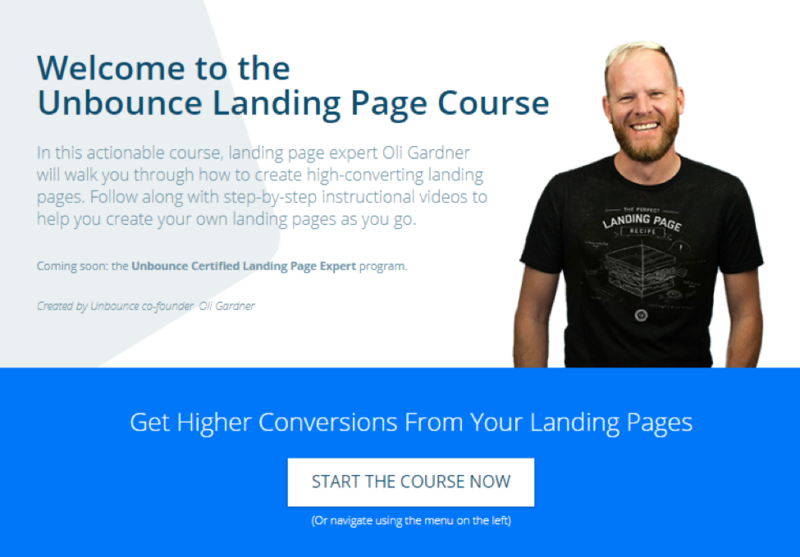 There are two methods of experimenting with your landing pages. The first is to test one element at a time, like your ad copy above. For example, a different headline or call-to-action. The second approach is to completely overhaul your landing page and test it against the existing one. This is a good approach if you’re not experiencing incremental changes from one-off experiments like the above. As you can see, this resulted in a 15% increase in conversions. Not bad for such a small change! You now know how to create a B2B PPC strategy that generates targeted traffic and converts them into qualified leads. With Facebook making drastic changes to their platform this year, SEM will be an even more desirable marketplace for advertisers. Get in there first and make your mark ahead of the competition.